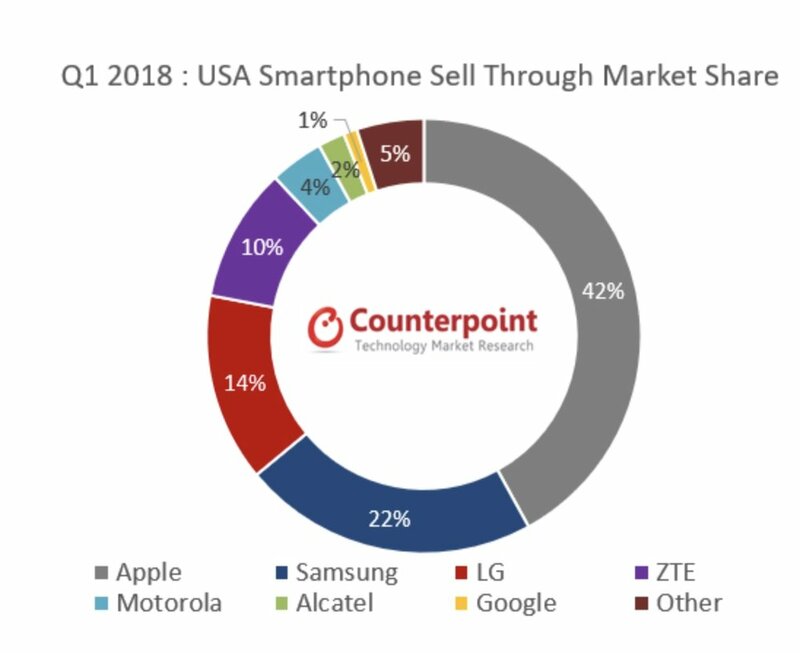 According to the latest research from Counterpoint’s Market Pulse program, the U.S. smartphone market saw sales of 38.7 million units during the first quarter [Q1] of 2018. That’s a 11% decrease from Q1 2017 when sales were 43.7 million smartphones. Sales hadn’t dropped below 40 million for the last three years. Apple shipped a record 16 million iPhones for the first time ever in a Q1 in the US. This is a 16% year-over-year increase, with the tech giant showing continued success in taking share away from Samsung in the premium market space. Counterpoint says Apple now commands 80% of the +$800 price band. Six of the ten best-selling smartphones in the U.S. are iPhones. Samsung’s growth curve is slipping. The research group says there’s increased difficulty maintaining momentum through product lifecycles.